For many asthmatics the daily routines of asthma management can be a complex process entailing monitoring the condition, logging results and inhaling the medicine in the right way. This project of short duration was an interdisciplinary collaboration between product and interaction designers. The goal of the project was to design a product or service with a strong focus on sound design, in our case related to asthma management. Our solution (Otto) merges monitoring, logging and medication into one product experience with the aim of facilitating the daily life of an asthmatic. The product helps the user to track their personal breathing curve and to adjust the dosage depending on the current situation. By using sound and light feedback, Otto is guiding the user through the whole process. How might we improve asthmatics' daily routines by facilitating the medicine inhalation process? Otto works by exhaling through the mouthpiece to take a peak flow measurement. The medicine dosage is adjusted automatically based on the measurement and is then inhaled through the same mouthpiece in spray-form. The lights work as silent indicators of progress, while the sounds function as confirmation and attention-grabbers; in tandem they unite the process feedback. The measurements are logged automatically and sent to the patient’s digital journal when Otto is charging, allowing experts to get a deeper understanding of the conditions of each individual. Shake Otto to activate it and in order to mix the medicine. Exhale through the mouthpiece to take a peak flow measurement. The dose of medicine is adjusted based on the result. Inhale the dose. Lights indicate time for inhalation and holding breath. A confirmation sound informs you when the process is terminated. Measurement data is logged into the back-end of the product and sent into the personal digital medical journal when Otto is charged. An alert wake up sound confirms that Otto is ready to use after shaking. A chord sound confirms the process completed. An increasing confirmation sound indicates when the peak flow meter test is completed. Two tones sound when charging has started. No buttons. No app. No screen. Just breathe. By utilizing a new type of medicine delivery that is activated by inhalation (rather than pressing a button), we removed the step of having to time the spray-release with inhalation, a step still necessary in the asthma medicine management of today. Using two membranes directed in opposite directions we could use the same mouthpiece for both measuring exhalation values, as well as inhaling the asthma medicine. 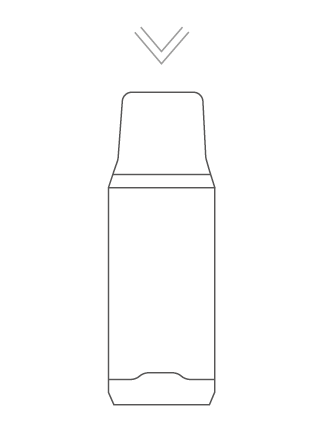 Otto can be re-useable as the mouthpiece can be separated and cleaned, and in addition the medicine canister can be changed when opening the lower part. Asthma is a chronic inflammatory disease in the airways of the lungs and is triggered by multiple factors; allergies, pollution, sickness, exercise or even the weather. The unpredictable nature of these triggers makes it hard to predict when and where an asthma attack may occur. 235 million people have asthma worldwide and 250,000 people die annually from the disease. When starting this project, we researched how and where people are using their asthma inhaler and how the asthma treatment process currently works. Asthma medication is monitored and usually adjusted twice a year by a doctor by measuring the condition with a peak flow meter. It is a hand-held analog device which measures a person’s lung capacity. Patients with serious asthma problems have their own peak flow meter and regularly write down their results in a paper diary. The diary is brought to the doctor who evaluates the condition based on the results and changes the dose if necessary. Through a spray or powder form asthma medication is inhaled through an inhaler. There’s one for emergencies and one for daily use. To get a deeper understanding of the experiences of living with asthma, we did interviews with people suffering from the condition. We learned more about the usage and function of different inhalers, what the interviewees find as the biggest challenges in their daily routines and how asthma affects their emotional and physical well-being. To be able to understand the challenges and wishes from an expert’s point of view, we visited the local health care centre. Together with the expert we tried out and discussed the existing products and learnt more about what makes a product functional or not. Today the user must visit a doctor to adjust their medication approximately twice a year. Then an optimal adjustment frequency of the medication for the daily inhalation is regulated. We learned that 70-90% are using their asthma inhaler in the wrong way; shaking the inhaler, timing spray with inhalation, and making sure the medicine stays in your lungs are all crucial, but often done incorrectly. Over- and under-medication – which can make the health condition worse – is common due to the fixed medicine dosage and the uncertainty if you inhaled correctly. How much medicine do I need today? Did I inhale correctly? Is my condition improving? These are important user requests that are currently not met. To get a closer understanding of living with asthma, we experimented using trying to breathe through a straw, experiencing the sensation of panic having restricted access to air. We looked into existing products on the market today to be able to analyze details and functions of both the peak flow meter and the inhalers. With our knowledge from the research process and interviews we started to brainstorm and map out our findings, looking for crucial aspects to include in our device. To create a holistic picture of the user flow, a flow chart was structured with the aim to understand each step in the guiding process. The intention was to provide a seamless transfer in between each step for the user. We produced our own sounds with a synthesizer to match the form expression of the product. Our wish was to create sounds that felt precise and uplifting, yet subtle. All sounds were supposed to stay within a coherent sound family and reinforce the identity of the product. To test how the lights work together with the sounds, different versions of light feedback were animated. Both sounds and lights were merged into the animations to provide increased understanding of the development of the final product. I was involved in the whole process of this project, from research to execution, with a main focus on the interactions including lights and sounds and how they work together as feedback for the user. I also edited all the sounds. Working with two colleagues from the Advanced Product Design program, I witnessed how our different expertise complemented each other in a fruitful way. Another important learning outcome for me was how sound can influence our experiences of a product and how to combine form, sound and light into a whole experience for the user.